(CNN) -- The U.S. Senate on Thursday passed a $106 billion spending bill that includes about $80 billion for the wars in Iraq and Afghanistan, sending the bill to the White House for President Obama's signature. 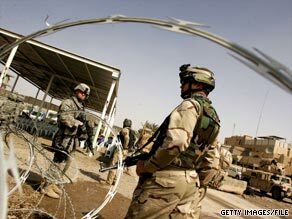 U.S. soldiers stand guard in Baghdad, Iraq, in March. The money will fund the wars through October. The 91-5 vote followed a much closer procedural vote that added $1 billion in start-up funds for the "cash for clunkers" program, an effort to revive the stalled U.S. auto industry. The money brings the running tab for both conflicts to about $950 billion, according to figures from the Congressional Research Service. The agency estimated that more than three-quarters of the money so far has gone to the war in Iraq, where most of the U.S. troops sent to those conflicts have been deployed. The spending bill also authorizes the International Monetary Fund to borrow up to $100 billion, a provision Republicans criticized as a "global bailout." The international agency offers lifelines to countries in crisis, and has been heavily tapped during the current global recession. The spending bill narrowly survived a nail-biter of a vote in the Senate earlier Thursday over the "cash for clunkers" provision, which will offer buyers up to $4,500 to trade in gas-guzzling vehicles for more fuel-efficient models. Democrats needed four Republican votes to reach the 60 needed to waive a budget rule and attach the $1 billion appropriation to start the program, and Washington Democrat Maria Cantwell switched an earlier "no" vote to keep it alive. The House passed the bill -- including the car provision -- on a 226-202 vote Tuesday, with all but five Republicans and 32 Democrats voting against the measure. House GOP leaders had urged their members to oppose it because the Senate had added the IMF loan provision. The Democrats who opposed the bill were largely from the anti-war "Out of Iraq" caucus.